The brilliant diamond in this 1940s vintage mens wedding band is mounted in a classic gypsy setting, complete with the star-shaped engravings typical of 19th century gypsy rings. To make a gypsy setting, a goldsmith first drills a precisely calibrated hole into the band of the ring. He then presses the gemstone into the hole up to its girdle. After taping the stone and mounting to protect them, he rims the stone with a ring of molten metal and gently taps around the stone at 12 o'clock, 6 o'clock, 9 o'clock, and 3 o'clock. He continues tapping gently at these points until the metal firmly hugs the stone, which appears nearly flush with the mounting at this point. As the metal begins to harden, he may use a chisel to add the star-shaped design flourishes. This was common practice for gypsy rings at the turn of the 20th century. Since yellow gold was still the fashion of the day, platina was most definitely out of place. 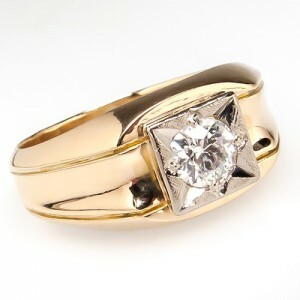 As time progressed, both white gold and platinum became widely used for crafting rings for both men and women. What once appeared odd became highly fashionable and remains so to this day. With the resurgence in popularity of antique and vintage engagement rings, the gypsy setting proves a wise and fashionable choice in wedding jewelry, especially for men. The classic lines of the design, long associated with masculinity, offer a sophisticated way for men to include a little dazzle in their wedding bands. And the security afforded by the gypsy setting makes it an ideal choice for men's jewelry who use their hands a lot, especially if their work requires the use of tools or heavy equipment. How about it, men? Would you choose a gypsy set wedding band? *Platina is a native alloy of platinum with paladium, iridum, osmium, etc. "Cause and Effect." The Jewelers' Circular and Horological Review, Volume 15, No. 1 New York, February, 1884, p. 4.